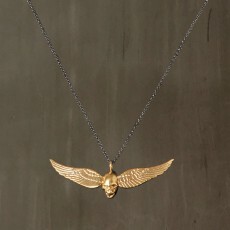 Skull with wings pendant handcrafted with 24K Gold plated Bronze. Long Black Rhodium plated 925 Sterling Silver chain 100 cm (39.4 in) Pendant 6 x 1.8 cm (2.4 x 0.7 in) .. 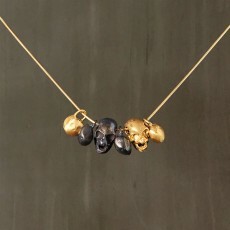 The Funky Skull pendant necklace features a Red skull topped with a tiny 24K Gold plated Bronze crown. Detailed with a bronze bead. 24K Gold plated Sterling Silver ball chain 40 cm (15.7 in) Skull: Length 1.2 cm x 1 cm (0.48 x 0.40 in) Crown diameter: 0.9 cm (0.35 in) .. 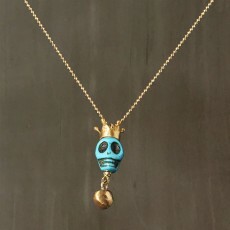 The Funky Skull pendant necklace features a turquoise color skull topped with a tiny 24K Gold plated Bronze crown. 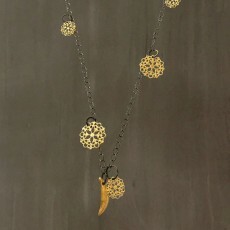 Detailed with a bronze bead. 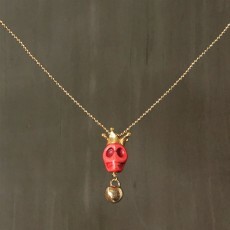 24K Gold plated Sterling Silver ball chain 40 cm (15.7 in) Skull: Length 1.2 cm x 1 cm (0.48 x 0.40 in) Crown diameter: 0.9 cm (0.35 in) ..
Skull pendant necklace features a White skull, topped with a tiny 24K Gold plated Bronze crown. 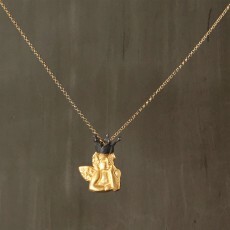 Detailed with a 24K Gold plated Bronze bead. 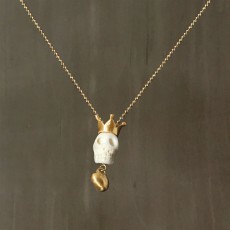 24K Gold plated 925 Sterling Silver chain 40 cm (15.7 in) Skull: Length 1.2 cm x 1 cm (0.48 x 0.40 in) Crown diameter: 0.9 cm (0.35 in) ..
Two tone Skulls necklace consists of two small Bronze skulls and four Bronze beads which are 24K Gold plated, and Black Rhodium plated for color contrast. 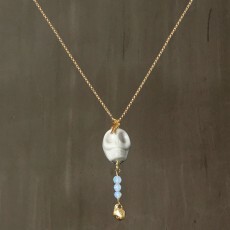 24K Gold plated 925 Sterling Silver chain 40 cm (15.7 in) Skulls: 1.2 cm x 0.7 cm (0.50 x 0.30 in) ..
Skull pendant necklace with moonstone beads. Topped with a tiny 24K Gold plated 925 Sterling Silver cross. 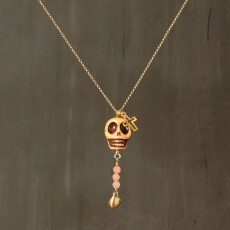 24K Gold plated 925 Sterling Silver chain measures 80 cm (31.5 in) Skull: Length 1.8 cm (0.70 in)/Width 1.4 cm (0.55 in) ..
Skull pendant necklace with Salmon colored Jade beads. Topped with a tiny 24K Gold plated 925 Sterling Silver cross. 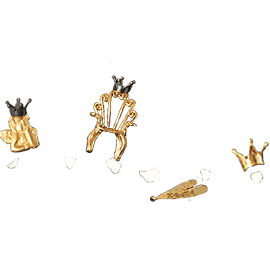 24K Gold plated 925 Sterling Silver chain measures 80 cm (31.5 in) Skull: Length 1.8 cm (0.70 in)/Width 1.4 cm (0.55 in) ..
Large hoop earrings 925 Sterling Silver with 24K Gold finish, feature small skulls and beads made with Bronze and finished with 24K Gold and Black Rhodium plating to create a two-tone effect. 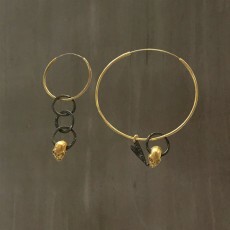 Hoops Diameter: 5.5 cm (2.2 in) Skull: 1.2 x 0.5 cm (0.47 x 0.2 in) ..
Two-tone asymmetrical hoop earrings 925 Sterling Silver with 24K Gold finish, feature Black Rhodium plated Bronze rings linked to 24K Gold plated skulls. 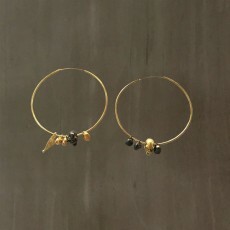 Hoops Diameter: Large 5.5 cm (2.2. in)/Small 3 cm (1.2 in) Rings Drop from small hoop measures 4 cm (1.6 in) Skull: 1.2 x 0.5 cm (0.47 x ..